It’s rare that I accept review copies these days, but a book about the so-called School of Paris wasn’t something to pass up. I don’t regret accepting Shocking Paris as I’ve read it in a couple of days, something I rarely do with nonfiction. I really liked it a great deal. It was as fascinating as it was informative. Stanley Meisler is a distant relative of Chaim Soutine, which may explain his interest in a painter who isn’t as well-known in the US as in Europe. Soutine isn’t the only writer Meisler writes about. His topic is the School of Paris – a group of influential, mostly Eastern Jewish painters, who were living and working in Paris from the years just before WWI until WWII. Most of them lived and worked in Montparnasse in the famous La Ruche residence. Back then Montmartre had already lost its importance for painters and was slowly turning into the tourist trap it still is. While Chaim Soutine is his main topic, we read about many other painters, notably Amedeo Modigliani, an Italian Jew, and Marc Chagall, still one of the most famous painters. The early chapters were particularly interesting because they describe how revolutionary it was that young Jewish men and women became artists and the struggle they faced because painting was against their religion. That certainly explains why so many left for Paris where important artists like Picasso resided. It also explains, as Meisler states, why there are no important Jewish painters prior to the 20th century. I’ve never been a fan of Soutine’s paintings, but it’s obvious that he was influential. You can see his influence in the works of painters like Francis Bacon and even Jackson Pollock. The landscapes he painted were always distorted, the people made ugly. And he had a special fondness for depicting bloody meat. Another typical trait was how thick the paint is on his paintings. Many appear three-dimensional thanks to those thick layers of paint. 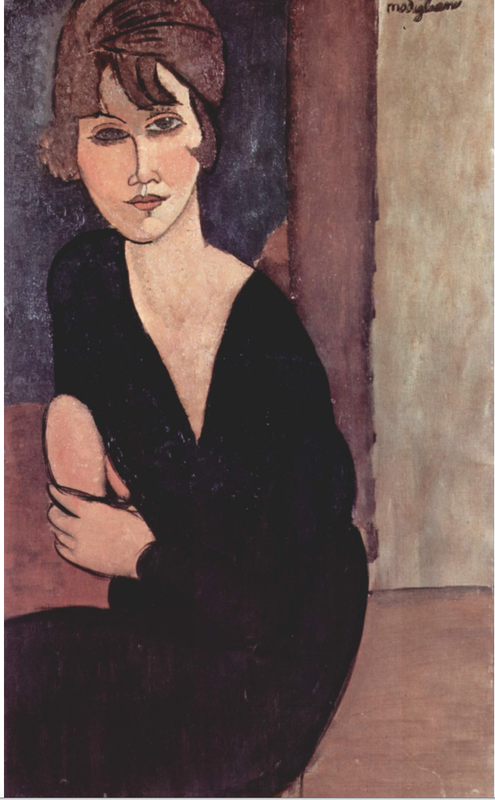 Modigliani, who was his close friend until he died too early in 1920, was a much more colourful person. Soutine was not only notoriously shy but awkward. He didn’t know how to make friends. According to Meisler, he rarely washed or changed his clothes and must have been rather revolting at times. He was also peculiar in so far as he destroyed many of his paintings. Either because someone said something he didn’t like about them or because he wasn’t satisfied anymore. 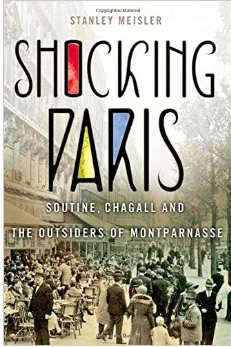 Shocking Paris was a fascinating book for many reasons. It was interesting to read about the School of Paris and the anti-Semitism they were facing, long before WWII. 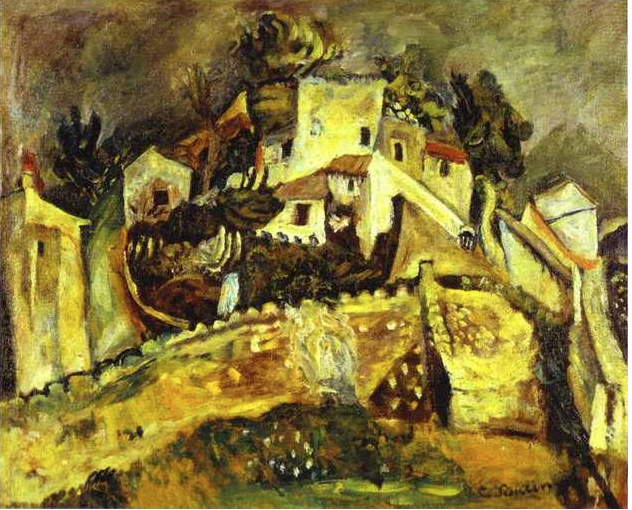 Chaim Soutine is one of only a few Jewish painters who didn’t change his name. It was equally interesting to read about the war and how Soutine managed to escape deportation. There’s a long chapter about Varian Fry, a young American, who helped many writers and painters to escape to the US. I’ve come across his name several times before. Some of the most famous people he helped were—Heinrich Mann, Lion Feuchtwanger, Franz Werfel, Max Ernst, André Breton, Hannah Arendt, Arthur Koestler and many more. Soutine spent parts of the war, hidden in Paris. Later he fled to the country with his lover Marie Berthe Aurenche, the ex-wife of max Ernst. His health had been bad for many years. He suffered from stomach ulcers and finally died in 1943 because he couldn’t be treated in time. He’s buried on the cemetery of Montparnasse in Paris. Early in the book Meisler writes that he avoided conjecture. Soutine was a complicated man and many of the things people say about him are contradicting. 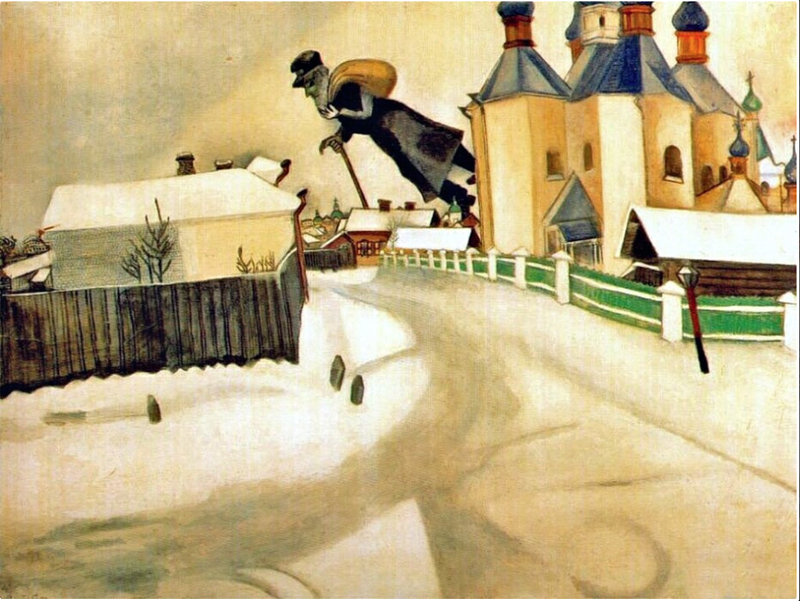 He wasn’t someone who spoke or wrote about his art or himself, like Chagall did. Nor was he good-looking and larger than life like Modigliani. Nonetheless, it’s always tempting to try to spice up a biographical account by adding anecdotes and using conjecture. Meisler doesn’t do that. The account is interesting but sober that’s why I wished the book had another title. I find it lurid. And misleading. At the time people were shocked that so many foreigners, especially Jews, occupied such an important place in the Parisian art scene, but there’s nothing truly shocking between these pages. I’m afraid the wrong reader might pick up this book. That’s too bad because it’s engaging and well-researched and focusses on painters and a movement which isn’t well-known outside of France. I highly recommend this book, not only to art fans and people interested in Soutine and Chagall, but also to those interested in WWII, Paris and the history of France (there’s a lot – highly critical parts – about Vichy France). Thanks to Palgrave Macmillan for the review copy. It sounds fascinating, and very good. Interesting about the thickness of the paint – that’s one of those things that are lost when we view images online – the physicality of the painting, scale, thickness of paint, brushstrokes. I saw again this weekend Hockney’s A Bigger Splash, a widely known image but in the flesh it’s a surprisingly big painting and the scale makes a real difference, as the thickness of the paint I suspect does for Soutine. It’s entirely fascinating. I agree, you need to see paintings to fully appreciate them. It’s much more tan just an image. there’s the scale, the texture. I was so surprised when I saw how small the Mona Lisa is for example. Soutine was a real precursor. I can’t think of any painter who who did the same. Some of van Gogh’s paintings are thick but not as much as these. He really carved into the paint. I’m not keen on those beef paintings but when you look at Bacon’s work you can see where he took some ideas from. I saw this book and thought it sounded interesting. Have you seen the BBC series The Impressionists? I really liked it its depiction of the closed art world. Plus the visuals… sometimes it was as though you were entering a Monet painting. I think you’d like it. It sheds light on many things. I haven’t seen that series. Thanks for mentioning it. I’m sure I’d love it. I love the sound of this, and it would probably follow on nicely from my reading of “In Montmartre” which was all about Picasso and co.
Oh yes, it would. He’s mentioned as well of course but doesn’t play an important role. I think he had a strained relationship with Modigliani but that was before Soutine arrived. Tragic figure Modigliani. I’be got his biography here. Wonderful review, Caroline! I loved the Modigliani painting 🙂 Chaim Soutine’s personality looks quite fascinating – very shy, difficult to understand but with a lot of hidden depth. People who knew him well were lucky. Varian Fry seems to have been a wonderful person. I didn’t know that Andre Breton was Jewish and he moved to the US during that time. I loved your comment about how the thick layer of paint makes the painting look three dimensional. Your comment on the Mona Lisa was also very interesting. I remember seeing another Da Vinci painting at the Hermitage and being surprised at how small it was (and a huge crowd was standing in front of it!!) It was also interesting to read your thoughts on Montparnasse and Montmartre – I didn’t know that the first one was more interesting than the other – I thought both of them were places were artists lived and worked. Thanks, Vishy. I love Modigliani’s art. André Breton wasn’t Jewish but he was persecuted by the Nazi’s like many other writers. I’m not sure now but possibly he was a communist. Varian Fry didn’t only help Jews. Sorry, that wasn’t clear. We often forget that other artist were in danger as well. I remember Soutine paintings and the paint is really thick. Montmarter was very important but earlier. Toulouse Lautrec and others were famous Montmartre pinatres but after WWI tourists started to flood it and the painters feld. I suppose they couldn’t afford it anymore. La Ruche in Montparnasse offered space for living and painting and was very cheap. Like max said, we don’t really know a painting as long as we haven’t seen it. We’ve got some lovely Chagall’s at the art musum in Basel. There as a big Soutine exhibition a few years ago. This sounds very interesting. I had no idea painting was against Jewish people’s religion but now it’s not. How did that happen and what’s changed, I wonder. It was very interesting. Strictly speaking it still is against their religion but they disregard it. That’s why they moved away from their home towns. I don’t think any of these painters were religious even though some follwed sme of the rituals. I don’t think any orthodox Jew would paint. Thank you for your review of this book, sounds like it’s well worth searching out. I definitely agree with you about Soutine’s meat paintings, but I do like his landscapes – they remind me a bit of El Greco. I wonder if the reason they feel so cramped might somehow reflect back on his early life in the Jewish ghetto where he grew up? My pleasure, Julé. 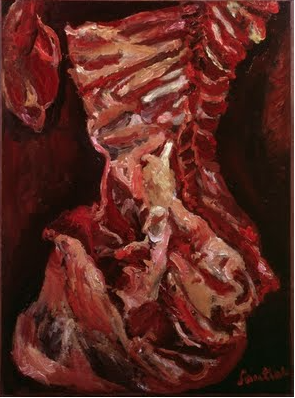 The meat paintings are hard to stomach but expressive nonetheless. I like some of the landscapes but many are too cramped for me. The book doesn’t analyze the paintings in depth. There’s the possibility that shtetl life is reflected in it. In any case, he’s a very interesting painter. They are paintings you really want to look at and don’t forget easily. I too had never heard that painting was against the Jewish religion. This book sounds so interesting, Caroline. I love Modligiani’s work and some of Chagall’s, but am not familiar with Soutine’s. 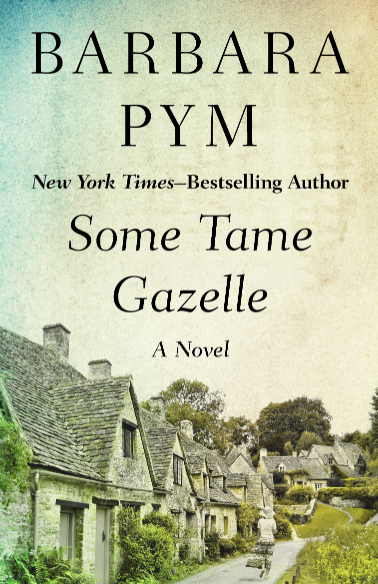 I agree the title is really misleading–it sounds like a book about scandals in Paris. I’m glad you feel the same about the title. 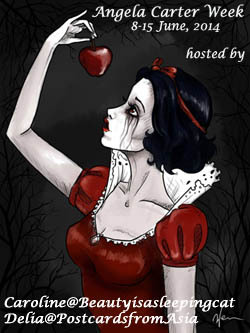 But I must admit – finding a title for this book wasn’t an easy thing. I suppose Soutine was the more influentila of the three, a real contributor to what came later but I like the others more. Especially Modigliani. 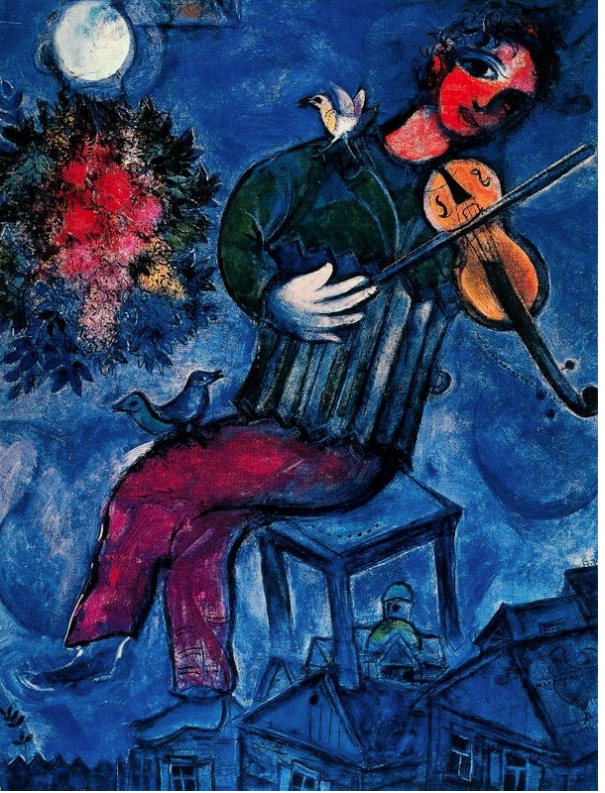 Chagall’s colors are lovely but he’s repetitive. I had forgotten that painting was against Jewish religion, so that was a good reminder. This does sound really interesting. I’m a fan of Chagall’s work, but I know very little about his life (other than bits and pieces I’ve gleaned from viewing some of his art). It’s good to hear about Varian Fry, he played such an influential role at the time. Thanks for reviewing this one, Caroline. My pleasure, Jacqui. I think it’s a great read. I came across Varian Fry in a book about German women writers. A truly astonishing man. I wish that I knew more about art and art history. Someday if I ever have more time. The parts relating to history sound very interesting. It is a good sign when an author avoids guesswork in a book like this. I think it must have been hard to stay away from guessing and choosing the most convenient interpretations. He did well to leave it up to the reader to decide or investiagte further. Art history is a fascinating topic.